The original boundaries of the Jewish homeland included present day Israel, Judea and Samaria. Most people have been taught that the State of Israel came into being in 1948 because of a vote in the UN General Assembly. Truth is, the Jewish homeland was actually established in 1922 at the San Remo conference. At the conclusion of World War I the European powers carved up the defunct Ottoman Empire and created in the Middle East three Arab states, a Christian enclave, and a Jewish state, the latter named “Palestine”. The original boundaries of the Jewish homeland included present day Israel, Judea and Samaria (now called the “West Bank”), Gaza, and Jordan, to approximate the boundaries of ancient Israel. 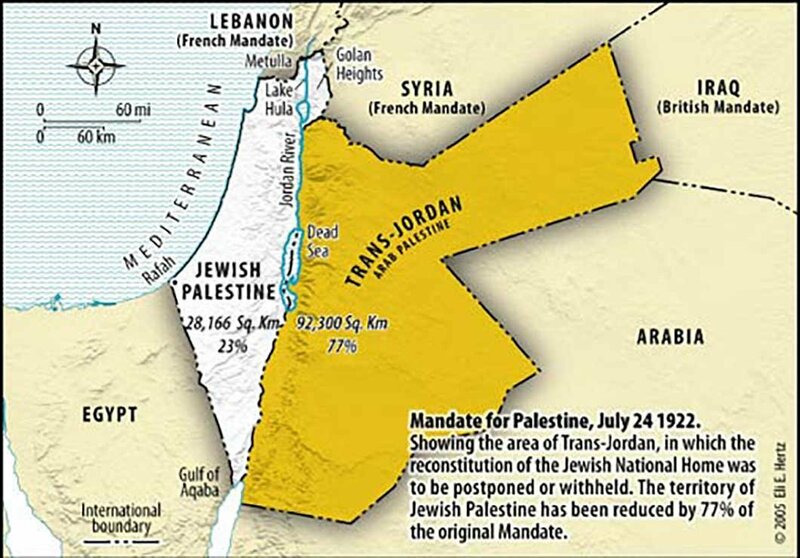 This territory was delegated to Great Britain to prepare the Jewish people for independence under the “Mandate for Palestine”. This document was unanimously adopted by the International Community, as represented by the League of Nations, predecessor to the United Nations, and has never been rescinded. It stands as the binding legal document concerning the Jewish homeland. Article 2 of the Mandate for Palestine invested in the Jewish community alone national and political autonomy with the understanding that the religious and civil rights of Muslims and Christians would be protected. The only ethnic group granted political rights to a state in Palestine were the Jews. There was no Arab nation of Palestine. The Arabs of the three other mandates were granted similar rights in their respective national homelands. 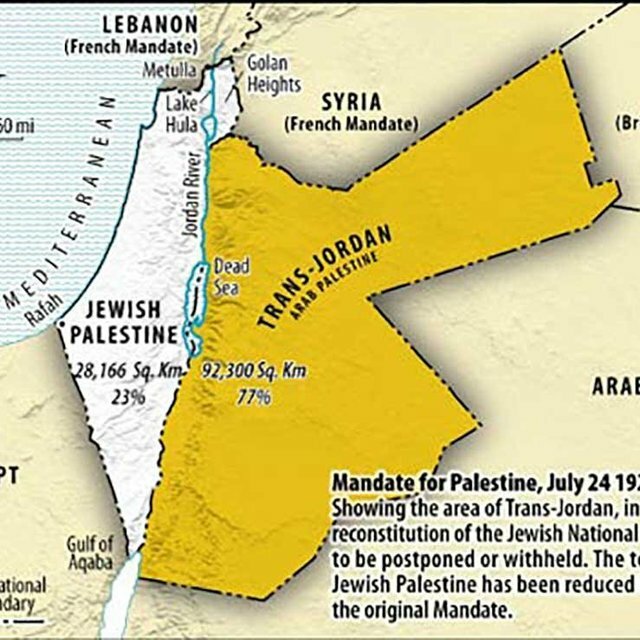 What transpired between 1920 and 1948 was an attempt by the British administrators who succeeded the previous government to undermine the intent of the League of Nations and the terms stipulated in the Mandate for Palestine. They wanted to curry favor with the Arabs who had newly acquired vast oil reserves. In 1922, Great Britain ceded almost three fourths of the Palestine Mandate to Emir Abdullah of Arabia to set up a 22nd Arab state, eventually named Jordan. All Jews were forbidden to live there, but they were given the right to live anywhere west of the Jordan River. The so-called “illegal settlements” are located on that very land that was guaranteed for Jewish settlement. Instead of facilitating the immigration of the world’s fourteen million Jews to their new homeland, they enacted a quota system that severely curtailed and at times abolished Jewish immigration. They turned a blind eye to the illegal entry of tens of thousands of Syrian, Egyptian, and Jordanian Arabs who poured into Palestine attracted by the relative affluence created by the Zionists. This was in violation of Article 6. Instead of cooperating with the Zionist organization in preparing the Jewish community for political independence as instructed by Article 4 of the Mandate for Palestine, the British sought to appease the Arab leaders who were inciting violence, even appointing Haj Amin al-Husseini, an ally of Hitler, as grand Mufti of Jerusalem. What was bequeathed to the Jews for the restoration of their homeland after 2,000 years of suffering as a pariah people scattered over the face of the earth was slowly eroded. By 1947, England walked away from its role as administrator of the Mandate, urging that the remainder of Palestine be further partitioned into yet another Arab state after three fourths had already been given to the Arabs. There remained a Jewish state on 10 percent of what had originally been granted. The Jews accepted. Anything was better than nothing. The Arabs rejected the partition, and five Arab countries invaded Palestine in a war of extermination. G-d deemed otherwise. The rest is history. Please bless, defend, and support the right of the Jewish people to the land that G-d has given them, and for which the world voted.